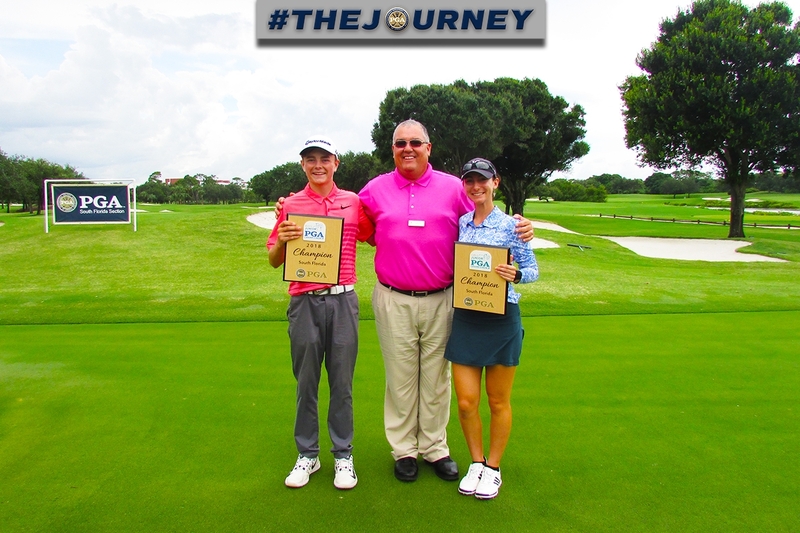 BOCA RATON (June 13, 2018) – It was a touch of déjà vu Wednesday in the South Florida Junior PGA Championship at Broken Sound Club. Luke Clanton of Miami Lakes was a repeat winner in the boys’ overall division, shooting a 2-under 70 on the Old Course to win by three shots at 6-under 138. Jillian Bourdage of Tamarac won the girls’ overall title for the second time in four years, with a 74 to also win by three at 1-over 145. “It was a grind,” Clanton said. “I knew there were going to be some low scores today, so I stuck with my game plan. I knew I couldn’t play conservatively if I wanted to win. Bourdage, who won the 2015 championship, struggled on her front nine, needing 20 putts during a 3-over 39. But she had only 11 putts on her back nine during a 35 that included a birdie on the closing green. The winners earned spots into the national Junior PGA Championship. The Boys Junior PGA Championship is July 31-Aug. 3 at Valhalla Golf Club in Louisville, with the Girls Junior PGA Championship on July 9-12 at Kearney Hill Golf Links in Lexington, Ky. The runners-up in the overall divisions also advanced to the national Junior PGA Championship, and it took a playoff to decide the girls division. Kerttu Hiltunen (74-148) of Palm Beach Gardens beat Chloe Kovelesky (72-148) of Boca Raton and Agatha Alesson (71-148) of Weston in a five-hole playoff. Cameron Piedra (66-141) of Coral Gables finished in solo second to take the boys second invite. The South Florida Junior PGA Championship is run by the South Florida PGA. Recent winners include LPGA star Lexi Thompson (2005), LPGA member Jay Marie Green (2009) and European Tour member Chase Koepka (2009), younger brother of U.S. Open champion Brooks Koepka.